Critically considered among the most influential Brazilian artists of his time, Mario Cravo Neto died August 10, 2009 in Salvador, Bahia, after an extended illness. The Afro-Brazilian culture distinct to the Bahia region of Brazil was central to Cravo Neto's interests and informed both his elegant black-and-white studio photographs and his vividly colorful street photography. Both bear formal and spiritual characteristics related to candomblé, the Afro-Brazilian practice that remains an essential part of the cultural fabric of Bahia today. Cravo Neto was born in 1947, the son of sculptor Mario Cravo Junior who introduced his son, then 17, to the art of sculpture and photography. The younger artist accompanied his father to Berlin during an artist's residency sponsored by the Ford Foundation, returning to Brazil in 1965 to complete his secondary education. He moved to New York in 1968 where he studied at the Art Students League. In 1970 he participated in the XII Bienal of Sâo Paulo with a large earth-based installation he had first essayed in New York. The work to come included installation and performance, in addition to exhibitions of black-and-white and color photography concerned with Afro-Brazilian culture. Cravo Neto exhibited internationally in leading museums, galleries, and festivals, among them the Palazzo Fortuny, Venice in 1988, the Yancey Richardson Gallery in 2001, Daros-Latin America Collection in 2003 and Rencontres d'Arles in 2005. He was the subject of exhibitions at the Museu de Arte de São Paulo (MASP), São Paulo in 1995; Photo España, Madrid,1998 and the Museo de Bellas Artes, Caracas in 2003. Among significant books published by the artist in recent years are Laróyè (2000); The Eternal Now (2002); Na Terra sob Meus Pés (2003) and Trance-Territories (2004). 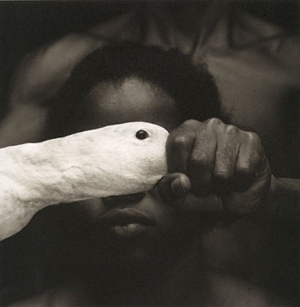 The photographs included in his most recent publication O Tigre do Dahomey – A Serpente de Whydah, (Salvador: Áries Editora, 2004) were the subject of an exhibition at São Paulo's Museu Afro-Brasil in 2005. The same year he presented Somewhere Over The Rainbow – La Mer a monumental video installation at Bahia's Museu de Arte Moderna, Salvador, a repurposed sugar plantation constructed in the 16th century by African slaves overlooking the Bay of All Saints. From 2004 to 2006 Cravo Neto participated in the exhibition Black Gods in Exile at the Museum of Ethnology in Berlin that also featured the photographs of the late candomblé adept Pierre Fatumbi Verger. Mario Cravo Neto is survived by his father, Mario Cravo Junior; by Eva Christensen and their daughter Lua and by a son, Christian Cravo, an established photographer; and by Angela Cunha and their children Lukas and Akira. According to Christian Cravo a foundation now in gestation is intended to preserve the work and memory of the artist, including all extant negatives and prints of important works already framed, consisting of not less than 350 signed and framed images and 200 to 250 large-format prints.